AEM one of Singapore’s electronic counters, continues its move up as the general market continues on its bullish momentum. AEM has since hit our second target of $0.925 and is one pip away from our third target of $0.96. Other electronic stocks like Hi-P has also shown some positive signs. 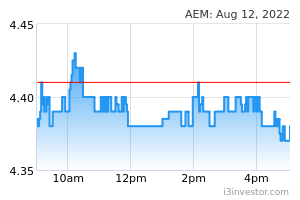 AEM was a stock that we share with our EXCLUSIVE CLIENTS back last week when it was just at $0.85. It had a good run of over 12% in under two weeks and we’re satisfied with the results. Perhaps a pullback might present an opportunity to scale back in. We’re watching to see if any pullback that might present some entry. What’s your trade plan for AEM? The post AEM – [ Up the AMP, Closing In To Our Third Target!] appeared first on Singaporehumblestock.